Saint Andrew the First-Called Day is one of the important religious holidays in Georgia. This holiday is annually observed on May 12. 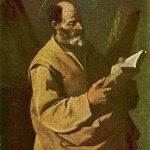 Saint Andrew was the brother of Saint Peter. It's believed, that he became the first preacher of Christianity in the territory of modern Georgia and the founder of the Georgian Orthodox Church. He is one of the three most important saints for the Georgian Church, as well as Saint George and Saint Nino. In 2008 a large statue commemorating St. Andrew was placed in front of a waterfall near the village of Sarpi, in Ajara region. It's believed, that St. Andrew the First-called crossed that waterfall during his travel in Georgia. The statue became very popular among the newly married, who believe, that it will bring them good luck in family life. Saint Andrew the First-Called Day previously was observed on December 13. But in 2002 the festive day was shifted to May 12 and it became an official holiday. This decision was dictated by the fact of the important role that St. Andrew the First-called played for Georgia.